The Vermont Tobacco Control State Plan (state plan) defines goals, objectives, and priority strategies and activities to guide the state’s tobacco prevention and control work during 2015–2020. This plan builds on the Vermont Tobacco Evaluation and Review Board’s previous comprehensive work plan for 2014–2017. The plan is intended to provide strategic direction to public and private sector programs, organizations, and agencies working on tobacco prevention and control in Vermont. Through aligned efforts and strategic action, Vermont’s comprehensive tobacco control program, partners, and other organizations and stakeholders will reduce the tobacco burden and disparities in the state, and reduce associated health care costs and chronic disease. 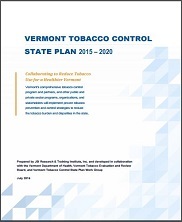 Development of the state plan was led by the Vermont Department of Health Tobacco Control Program (VTCP) as a requirement of its 2015–2020 cooperative agreement with the Centers for Disease Control and Prevention (CDC), and assisted by the Vermont Tobacco Evaluation and Review Board (VTERB) for coordinating public input. To ensure a comprehensive, feasible, and relevant plan, the VTCP engaged stakeholders from multiple sectors and regions of the state representing various populations and programs. Stakeholders provided input on their priorities and strategies to mitigate tobacco use and burden over the next five years. Additionally, the VTCP coordinated the Vermont Tobacco Control State Plan Work Group to provide expert guidance in identifying strategies and key activities to address tobacco prevention and control in Vermont through 2020. JSI Research & Training Institute, Inc. 2016.